Does it seem like every year your tomatoes get felled by disease? Follow these tips to have the healthiest tomatoes with the best harvests! Choose the most disease-resistant tomatoes you can. When plant shopping, look for those tomatoes with lots of letters with their name (VFNT, etc.). Each one of those letters stands for a disease that that tomato is resistant to. The more letters, the more disease resistance. 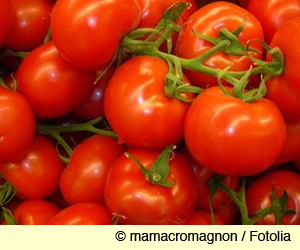 Give tomatoes huge amounts of sun. Tomatoes, natives of Mexico, hate shade and planting a tomato in even light shade is a sure-fire way to invite a host of blights and wilts. In Iowa, this far north, the sun is relatively weak. So unlike farther south where 8 hours of sun a day might be fine, tomatoes here need at least 10 hours of full, unfiltered light a day and I'd recommend 12 or even 14. Full sun all day long is ideal. This prevents soil from splashing soil-borne pathogens onto the tomatoes. My favorite mulch for tomatoes (and most other veggies) is two or three layers of newspaper topped by 2 or 3 inches of grass clippings. "Rotate" your tomato plantings. The ideal is to plant tomatoes in a different spot each year, being sure that each spot is at least 50 feet away from the previous year. Allow at least 2 years before planting tomatoes again in the same spot. Of course, this is the ideal. Not all of us have that much space to play with. However, if you plant tomatoes in roughly the same area year after year, you'll almost certainly be rather badly plagued with tomato diseases. So get creative. Consider planting tomatoes only every other year. Or plant tomatoes in your flower beds or in the front of the house. Or share a spot with a neighbor. Avoid an overhead sprinkler. Water the soil, not the foliage--it only encourages fungal diseases. And if you must use a sprinkler, water in the morning, not the evening, when it takes longer for water to evaporate off of leaves. Also keep the moisture in the soil consistent. When tomatoes go through dry-wet cycles, they develop blossom end rot--the bottom of the tomato goes black and rotten. So keep the soil around your tomatoes evenly moist.